DOGEN: THE LOST GENIUS OF ZEN by guest blogger Brad Warner, author of IT CAME FROM BEYOND ZEN! I first heard of Dogen when I was 19 or 20 years old. I am 53 now. So I’ve been acquainted with Dogen for most of my life. Dogen was a Japanese Buddhist monk and writer who lived around 800 years ago, from the year 1200 to 1254. He was barely older than I am now when he died. 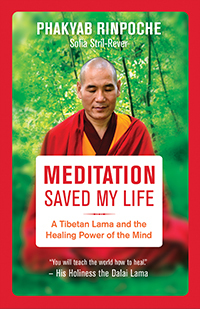 In 2003, Tibetan lama Phakyab Rinpoche was admitted to the emergency clinic of the Program for Survivors of Torture at Manhattan’s Bellevue Hospital. After a dramatic escape from imprisonment in China, at the hands of authorities bent on uprooting Tibet’s traditional religion and culture, his ordeal had left him with life-threatening injuries, including gangrene of the right ankle. American doctors gave Rinpoche a shocking choice: accept leg amputation or risk a slow, painful death. An inner voice, however, prompted him to try an unconventional cure: meditation. He began an intensive spiritual routine that included thousands of hours of meditation over three years in a small Brooklyn studio. Against all scientific logic, his injuries gradually healed. In this vivid, passionate account, Sofia Stril-Rever relates the extraordinary experiences of Phakyab Rinpoche, who reveals the secret of the great healing powers that lie dormant within each of us. 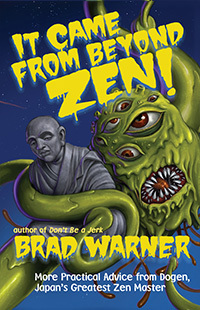 Soto Zen priest, punk bassist, and popular blogger Brad Warner answers some questions about his book Don’t Be a Jerk: And Other Practical Advice from Dogen, Japan's Greatest Zen Master, which offers a radical but reverent, modern spin on Dogen’s Treasury of the True Dharma Eye. Warner explains what “not being a jerk” actually meant in Dogen’s time, how easy it is to justify anything, and how you can tune in to your intuitive sense and be able to discern more carefully between what is right and what is wrong. (Video footage by Pirooz Kalayeh and I Like Nirvana Productions.) For more New World Library author interviews, visit our YouTube channel. I discovered the 13th-century Japanese Zen master Eihei Dogen when I was an 18-year-old punk rock bass player. Now I’m a waaaayyy-more-than-18-year-old punk rock bass player, and I’m still trying to understand his philosophy and practice. Dogen is unusual in the realm of Zen Buddhist thinkers in that he wrote his own stuff and was pretty young when he did so. Mostly when you read ancient Zen philosophy, you’re not only reading the words of a very old person, but you’re reading those words as interpreted by their students, since few of the old Zen masters (male and female, see below) were writers. Dogen was a writer, and what’s more, he started writing very early in his career. He did most of his writing when he was in his 30s and 40s. He became a monk when he was just 12. So while he’s very wise, he’s also young and fired up and often kind of ornery. Just the kind of thing a punk rock kid like me needed. Zen teacher Karen Maezen Miller is known for helping her readers and students understand that the contentment they think of as “out there” is actually here and now. The author of Hand Wash Cold and Paradise in Plain Sight, she also maintains a popular blog called Cheerio Road. We hope you’ll enjoy her list of 10 Ways to Create a Mindful Home, which is among the most popular posts she’s ever shared on Cheerio Road.